Fifteen world-class precision weapon systems are put into full production. Stand of Tactical Missiles Corporation displayed at the MAKS-2011 aerospace exhibition attracted hordes of people. Visitors were literally fascinated by shape perfection and eye appeal of air- and ship-based missiles. And experts were intrigued by performance characteristics of shown novelties. In this year, Tactical Missiles Corporation participated in the MAKS International Aviation & Space Salon for the first time. But if one start counting from the corporation's predecessor –Zvezda-Strela State Scientific and Production Center – the company attended all MAKS salons beginning from the first one in 1993. First MAKS aerospace show held in 1993 was a success for Zvezda-Strela center. Foreign specialists were captivated by firstly demonstrated antiship missile Kh-35E (letter 'E' in names of all weapon systems stands for 'export') for Uran-E ship-based missile system. The new advanced system attracted interest of Indian naval servicemen at once. And the most striking thing was that in contrast to usual years of negotiations, the contract for Uran-E missile system was tied with Indian Navy no later than in 1994. This fact indicates high combat characteristics and effectiveness of the shipborne missile system, as well as its relevance and great demand. Early 90's were disastrous for Russian defense industry. The contract with India helped the Zvezda-Strela center not only hold out but set up batch production of new systems. The company spent the income assiduously; it was directed for serial manufacturing of the ship-based missile system. First Uran-E system was mounted on Indian destroyer INS Delhi in 1996. Later on, other ships were equipped wit it as well. And other countries followed India then. Thus, Tactical Missiles Corporation has no doubts whether to take part in the exhibition. It has been always an active MAKS participant. 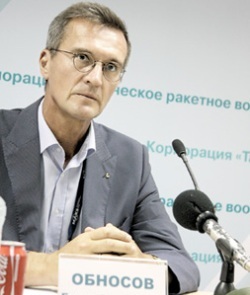 For the first time the corporation showed itself as an integrated structure at MAKS-2003. At that time it consisted of six enterprises with longstanding production ties. And at the salon of 2005 there were 14 companies representing products in the common stand. Among them were such recognized suppliers of high-precision weapons as Vympel, Raduga, and Region which were originators of new trends in up-to-date weapons. These three pillars along with the parent company had kicked Tactical Missiles Corporation to the world top level. So, it is no wonder that the corporation is permanently within the world's top hundred arms producers. As for now, the corporation contains 18 large enterprises. It is an integrated technological complex comprising network of design bureaus, pilot and batch production factories providing closed technological cycle of designing, production, testing, after-sale service, repair, modernization, and disposal of delivered products. All that was rooted in designing and production traditions developed for decades. Decree of Russian Government No. 149 issued on March 13, 2002 established open joint-stock company Tactical Missiles Corporation. Apart from Zvezda-Strela center, it included state-led companies Avtomatika Factory (Omsk), Iskra Engineering Design Bureau, Detal Planning and Design Bureau, Krasny Gydropress Plant, and JSC Soyuz Engineering Design Bureau. Later on, list of the corporation's affiliates was enlarged in accordance with presidential decrees No. 591 and No. 930 issued on May 9, 2004 and on July 20, 2007 respectively. But considering the fact that Zvezda-Strela center is core of the corporation, starting point of the company's history must be June 3, 1942 when the State Defense Committee issued a decree to establish 455th Plant within People's Commissariat of Aircraft Industry. In 1955, the plant was tasked to create air-to-air missile systems. It kicked off batch production of the first national guided missile RS-1-U for fighters MiG-17PFU and Yak-25P in 1956. On May 17, 1957 a design bureau was established on the basis of the plant's design department. In 60's the plant was producing surface-to-air guided missiles for Kub air defense system and air-to-air missiles R-8M, R-8M1R, R-8M1T, K-98, K-98MR, K-98MT, R-4, R-40. Along with combat missiles, the plant was manufacturing small-size target missiles ITs-59 Olen and ITs-60 Zayats used for training of pilots. On April 30, 1966 the 455th Plant was renamed into Kaliningrad Machinery Plant (KMP). Till 1996 Kaliningrad was the name of current Korolev, Moscow region. In November 1976 the plant was transformed into Strela Production and Design Association. On December 26, 1994 Strela machinery plant and Zvezda design bureau amalgamated. In 1995 that industrial formation obtained the name of Federal State Unitary Enterprise "Zvezda-Strela State Scientific and Production Center" (FSUE Zvezda-Strela). And in March 2003 the center was transformed into JSC Tactical Missiles Corporation. All these features form a "corporate style" of FSUE Zvezda-Strela preserved and developed by Tactical Missiles Corporation. It is clearly seen in the most known Soviet air-to-surface guided missiles. They are Kh-25M type multipurpose modular guided missiles, Kh-31 type high-speed guided missiles (antiradar version Kh-31P/PK, antiship version Kh-31A, target missile MA-31), and antiship guided missiles Kh-35E versatile in platform (in particular, 3M-24E naval version used in Uran-E ship-based missile system and Bal-E coastal defense missile system). JSC Vympel State Engineering Design Bureau named after I.I. Toropov was established in 1949 and located at 134th Aircraft Factory in Tushino (Moscow). That was a base factory for design bureau of Pavel Sukhoi. But after crash of prototype fighter Su-15, the bureau of not-yet famous designer was disbanded. Sukhoi was offered to engage in aircraft missiles, but he refused. The bureau was headed by Ivan Toropov then who became the founder of Soviet air-to-air missile engineering school. Within few months the new design bureau had created the first Soviet fire protection system PV-20 for long-range strategic bomber Tu-4 mounted in sighting stations, guns and machineguns, and remote control devices. For that project, Ivan Toropov and a number of designers won the Stalin Prize 1950. The bureau started to work on aircraft weapons since 1954. It was tasked to design missile K-7 for supersonic interceptor aircraft T-3 produced by Pavel Sukhoi. The missile's construction was based on modular principle which became distinctive feature of Soviet missiles. But the first completed project of Vympel design bureau was air-to-air missile K-13. The task was received in 1958. Test launch was held on October 21, 1959, and on December 1 – the first combat launch at target aircraft. In 1960 the missile was put into batch production under code number R-3S. It became a weapon of fighters MiG-19PG, MiG-21, MiG-23, Su-20, Yak-28P. Modifications of R-13R, R-13M, R-13M1 were manufactured in India, China, Czechoslovakia, and Poland. Up to the present day, Vympel State Engineering Design Bureau remains Russia's leading organization designing air-to-air guided missiles for land- and sea-based air defense systems and air-to-surface guided missiles (Kh-29T/L, Kh-29TE). Enjoying the right for foreign economic activities, the bureau offers modernization of previously sold air-to-surface missiles Kh-29T/L up to Kh-29TE with longer flight range. JSC Raduga State Engineering Design Bureau named after A.Y. Bereznyak is located in Dubna, Moscow region. Initially, it was established at 1st Plant in accordance with the resolution of Cabinet Council issued on September 1, 1951 providing researches in "Subject B", i.e. cruise missiles. Structurally, it was an affiliate of Artyom Mikoyan's design bureau OKB-155. Order of Mikhail Khrunichev, the then-minister of aircraft industry marked activity areas of the new bureau: "...preparation for batch production, outfitting works and tests, and further development of unmanned airplane KS". In addition, the affiliate was tasked to work on first Soviet guided weapons, such as missile planes, missiles of air-to-surface, ship-to-ship, and surface-to-surface classes. That design bureau named OKB-155-1 was headed by talented designer Alexander Y. Bereznyak. The first task was to finish and prepare for unmanned jet airplane KS designed by OKB-155 for batch production. Alexander Bereznyak organized perfect coordination amid designers, workshops and the plant's design office. As a result, no later than in 1953 state trials of Kometa missile system (carriers are Tu-4K, Tu-16) were completed, and it was put into service. In 1955 the affiliate of OKB-155 was ordered to design radically new sea-based cruise missile P-15. Within a year the bureau had completed technical documentation and put the missile into production. Seven months later, on October 16, the first test of P-15 was held in the Black Sea by Project 183E missile boat. In 1960 the missile was commissioned. For creation of P-15 missile, designers were awarded the Lenin Prize in 1961. The missile left its mark in the world rocketry history on October 21, 1967 during Arab-Israeli conflict when it scuppered Israeli destroyer Eilat. That was the first combat use of homing cruise missile with liquid propellant jet engine. In 1966 OKB-155-1 was transformed into independent organization – Raduga Engineering Design Bureau. By that time the bureau's projects had won several Lenin Prizes and State awards. High professionalism of Raduga designers is proved by the fact that in 1970 Mikoyan's bureau handed over all development works on Project Spiral experimental piloted orbital aircraft to Raduga bureau. Although the work was going on effectively, the project was shut down in 1979. However, best practice of Raduga was widely used at Energia-Buran space rocket system. Through 60 years being the leader in missile system engineering, Raduga bureau has accumulated unique scientific, technical, and designing experience in the whole cycle of missile weapons' development, production, operation, and modernization. Only within the recent five years, 5 types of precision weapons have been developed and commissioned into Russian Air Force and Russian Navy. Throughout is history, the bureau has designed over 50 systems of missile weapons. Most of them had breakthrough nature opening new horizons for development and use of missile arms. scientific and technical background for creation of hypersonic missiles. JSC Region State Research and Development Enterprise is leading designer and supplier of guided air bombs for front-line aviation which is one of the most prospective classes of precision weapons. The enterprise was established in 1969 as research institute of applied hydromechanics, and its basic activity was development of guided antisubmarine weapons. Having appropriate laboratory and testing facilities, Region State Research and Development Enterprise places high emphasis on research and development work in the area of aerodynamics and hydrodynamics of underwater fast-speed objects, as well as propulsion systems for underwater weapons. Glide bombs designed by Region are classified as high-precision weapons and notable for high combat effectiveness, jamming resistance, and reliability proved out during service in Russian Air Force. Key feature of glide bombs is combination of high accuracy sometimes comparable to guided missiles and considerable warhead yield. Today, glide bombs are equipped with television/correlation, laser/gyrostabilized, and satellite guidance systems providing impact accuracy within the limits of 3-10 meters depending on altitude of bomb release and speed of aircraft. As of cost-effectiveness ratio, such bombs outclass regular ones in 10-30 times. Under certain conditions, glide bombs are comparable to guided missiles in this criterion, but are much cheaper and powerful. Presently, Region State Research and Development Enterprise produces 250-, 500-, and 1,500-kg glide bombs. They can be armed with wide range of warheads (concrete-piercing, penetrating, and fuel-air explosive). Specially designed warheads are capable to destroy high-tensile targets bunkered or ambushed in terrain. Further development of glide bombs is primarily associated with improvement of guidance accuracy and range which would make possible to drop bombs beyond an opponent's air defenses. Obviously, in the near term reconnaissance and attack unmanned aerial vehicles will gain considerable positions in military aviation. Therefore, there is a trend to develop small-size glide bombs, i.e. no heavier than 100 kg. Integral innovative activity index of any company is its rate of production update and competitiveness amid the world leaders. Given that through recent two decades JSC Tactical Missiles Corporation has made very few new or upgraded products, it presently prepares 15 new types of high-precision weapons to be put into batch production at once. 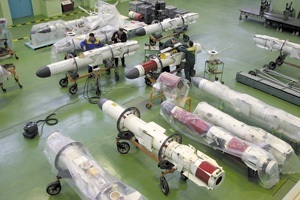 In particular, the whole lineup of air-based guided missiles. Kh-59MK2 missile (designed by Raduga State Engineering Design Bureau) equipped with optoelectronic correction and terminal guidance system is capable to destroy wide range of land-based targets with known location coordinates including those not radiating and having no radar, infrared and optical contrast against surrounding background. - Kh-59MK extended range missile (Raduga bureau) capable to destroy wide range of sea surface radar-contrast targets with radar cross section of over 300 sq meters (including cruiser-type targets), 'fire-and-forget' principle, day-and-night, all-weather. It is adapted to all Russian front-line aircrafts. ÞKAB-500S-E glide bomb with satellite guidance system and high-explosive warhead; capable to destroy targets with known location data input prior to drop zone. Correction upon the carrier's navigation system is capable as well. Hitting accuracy is 7-2 meters; release altitude is 500-5,000 meters; 'fire-and-forget' principle; day-and-night; all-weather. KAB-1500LG-F-E glide bomb with high-explosive warhead and semiactive laser gyro-stabilized homing system; capable to destroy static land- and sea-based targets like railroad and highway bridges, military industrial assets, ships, and fortifications including those ambushed in terrain. Single or salvo releases are possible from front-line aircraft equipped with laser illumination system or simple collimating sight for initial targeting (when used ground-based illuminator). Guidance accuracy is 4-7 meters; release altitude is 1,000-8,000 meters. RVV-BD long-range guided missile firstly demonstrated at MAKS-2011 exhibition. Comparing to previous long-range R-33E, the new missile has considerably improved performance characteristics. High aerodynamic features of RVV-BD, dual-mode solid engine, and launch weight up to 510 kg increases the missile's launch range up to 200 km (R-33E has 120 km) and gives the capability to hit targets with acceleration up to 8 g (R-33E – up to 4 g) at altitudes from 15 meters to 25 km. It should be noted that despite some mentioned projects reserved names of previous items, they are virtually new weapons. All of them have been designed at new engineering level based on wide use of digital technologies, state-of-the-art principles and guided systems which significantly expanded combat capabilities. New generation of high-precision weapons demonstrated at MAKS-2011 exhibition contribute much to the brand of Tactical Missiles Corporation as large diversified effectively functioning company capable to deliver world-class production.